Employment - Champion Bolt, Inc. 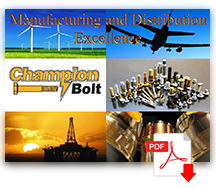 Thank you for your interest in employment opportunities at Champion Bolt. Champion Bolt employees embrace the challenges inherent in maintaining a dynamic and exciting work environment. Champion Bolt offers a comprehensive benefits package, competitive salaries, and an opportunity to work in an innovative business environment. At Champion Bolt, is our policy to provide equal employment opportunities for all applicants and employees. If you're interested in joining our team, please submit a cover letter along with your resume, and three references to the address below. To enquire about specific positions that may be available, click here to contact us and tell us a little more about yourself and the type of position you are seeking.